Kyoto is an extremely popular tourist destination. The city often in the top ranking of "Best in Travel" features which is also the reason for an ever-increasing number of tourists, particularly in the wake of the Tokyo 2020 Olympics. Escape the city and explore some off-the-beaten-path areas for a more relaxing pace, including Fushimi, the part of the city famous for the Fushimi Inari Taisha (Fushimi Inari Shrine) and its sake production. When visiting Kyoto, a trip to the acclaimed Fushimi Inari Taisha, renowned for its estimated one thousand vermilion torii gates, is probably going to be high on anyone's must-see list. Tourists flock there by the thousands to take pictures of the famous shrine and the gates but this can attract a rather large crowd even during the off-season. If you would like to avoid the crowds, how about exploring another side of Fushimi? From central Kyoto take the Nara line south to Momoyama station. 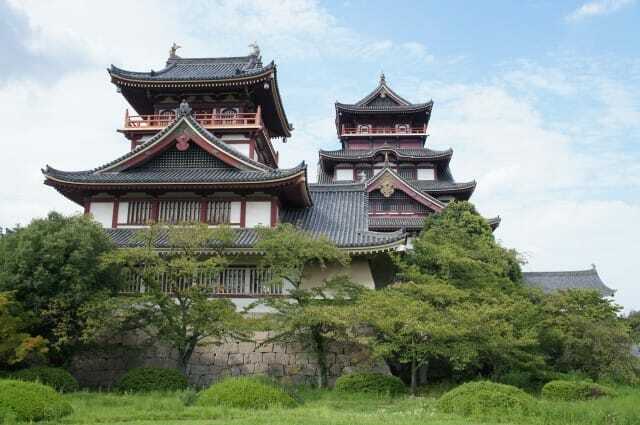 From here you can take the short walk to the imposing remains of Fushimi Castle. Unfortunately, the interiors of the castle are no longer accessible by visitors as it has been closed by the tourism office due to dwindling visitor numbers but there are plans to reopen it in the future. The exterior and atmosphere are truly impressive and are definitely worth the trip. There are fewer crowds and the building’s facade is a brilliant backdrop for photographs free from wandering tourists. The castle, originally built for the famous warlord Toyotomi Hideyoshi between 1592-1594, is also the place in which he passed away in 1598. It was famously destroyed in an eleven-day-siege in 1600, where the defending army was defeated and committed seppuku*. Their blood soiled the floor so deeply, it was impossible to remove. The castle was broken down and the blood-soaked floorboards were moved and repurposed into the ceilings of five temples in Kyoto Prefecture. You can famously see bloody footprints, handprints and even faceprints on the ceilings of those temples. The Karamon Gate at Nishi Honganji Temple was also relocated from Fushimi Castle. *seppuku: Ritual suicide by disembowelment usually performed by samurai after they dishonored themselves or to prevent falling into the hands of their enemies and likely suffering torture. After you've explored the grounds of the castle, make your way further south to the famous sake production district. The old wooden warehouses offer a glimpse into historic Kyoto and what it must have been like to wander the streets in old times. Besides many other art and craft fields, Kyoto is renowned for its sake brewing. Fushimi, blessed with pure spring water and access to the best possible rice from its active river port, is the ideal location for sake production. Today the long tradition of sake brewing continues. Much work has been put into preserving the area and the history that it conveys. February means the hands-on production of new sake for the year all over Japan. During this time many of Fushimi’s breweries and museums open their doors to visitors to experience the magic of sake making. It’s the perfect place to learn about the tools and processes that go into conventional sake making methods. English translations are available at many of the breweries and museums. Most places also offer free tastings of their delicious products. Many of the wooden warehouses are situated next to a flourishing, green canal-way. After your sake education, you can wander the neighbouring pathway or join a relaxing Jikkokubune Canal Cruise. Jikkokubune are flat-bottomed boats that formerly carried rice and sake to and from the old Fushimi river port. Today, they're equipped with passenger seats allowing for a gentle canal cruise, taking in the beauty of Fushimi's neighbourhood. After a busy day of sightseeing in Fushimi, don't leave before visiting a local restaurant and indulging in some sake tasting. There's an array of eateries offering tasty dishes, local sake, and a great atmosphere. You can tell if the restaurants serving sake by the balls of cedar hanging at their entrance, known as sugidama. They are also the perfect way to tell at what stage the sake within is, with fresh green sugidama symbolizing new sake of the year and older brown ones suggesting that the sake is maturing nicely. There’s more to Fushimi than meets the eye so how about getting lost amongst traditional backstreets to find some of the best bars and restaurants in the city. Beautiful traditional streets are calling out to be explored and fresh sake is waiting to get tried by you. Exploring Fushimi is a perfect way to see another, more traditional side of Kyoto far from the usual crowds.